On January 21, 1970, Jan Scruggs was having his morning cup of coffee, but he was far from his kitchen table at home. He was in Vietnam, serving in the 199th Light Infantry Brigade. In the nine months since he’d been in-country, Scruggs had already seen a lot of action and had been wounded in a battle near Xuan Loc. He had spent three months recovering in a hospital before being sent back to fight with rocket-propelled grenade fragments permanently embedded in his body. On that January day, “There was a big explosion,” Scruggs recalled. “I ran over to see a truck on fire and a dozen of my friends dying.” They had been unloading an ammunition truck when the explosion occurred. Scruggs would never forget the awful scene. He would never forget those friends. In fact, he would spend a lifetime trying to honor their memory. When the 18-year-old Scruggs volunteered to enlist in the Army in 1968, debate surrounding Vietnam was escalating. The war’s length and the growing number of casualties were fueling tensions. Within months after he recovered from his wounds and returned to his unit, the American public was learning the details of the events at My Lai. By the time he returned home, three months after the explosion, the country was even further divided. Over the next few years, as the war came to a close and more and more troops returned home, the media began to paint a picture of the stereotypical Vietnam veteran: drug addicted, bitter, discontented, and unable to adjust to life back home. Like all stereotypes, this one was unfair. The truth was, veterans were no more likely to be addicted to drugs than those who did not serve. And if they were bitter, who could blame them? When they returned home from serving their country, there was no national show of gratitude. They were either ignored or shouted at and called vicious names. Veterans frequently found themselves denying their time in Vietnam, never mentioning their service to new friends and acquaintances for fear of the reactions it might elicit. 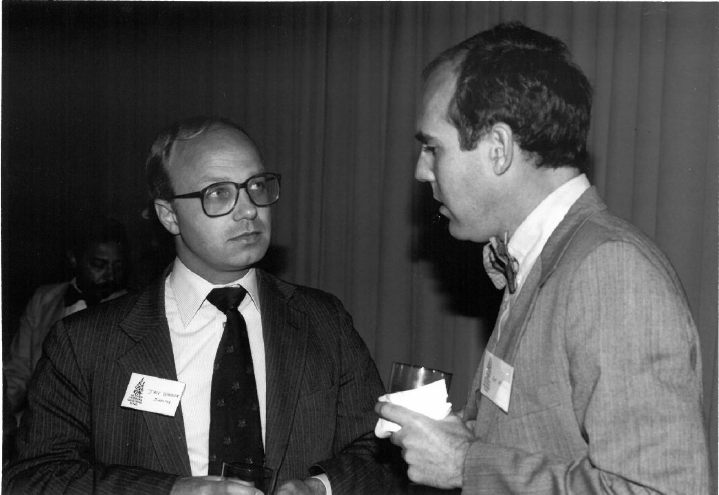 By June 1977, Scruggs was attending graduate school at American University in Washington, D.C. and had embarked on a research study exploring the social and psychological consequences of Vietnam military duties. He found that returning veterans were finding it hard to trust people. They were feeling alienated from the nation’s leaders, and they had low self-esteem. He also found that those veterans whose units experienced high casualty rates were experiencing higher divorce rates and a greater frequency of combat-related dreams. Using his findings, he testified at the Senate hearing on the Veteran's Health Care Amendments Act of 1977, with the hope that he could help veterans gain access to the services and support they needed. He also wanted to find a way to help them heal and suggested that the country build a national memorial as a symbol that the country cared about them. Jan Scruggs, along with Senator Pete Domenici (R-NM), announce plans at the National Press Club in Washington, D.C. to build a national memorial in D.C. dedicated to all those who served in the Vietnam War. By 1979, the country was beginning to have more positive feelings toward Vietnam veterans. Movies were dealing more realistically with their issues. 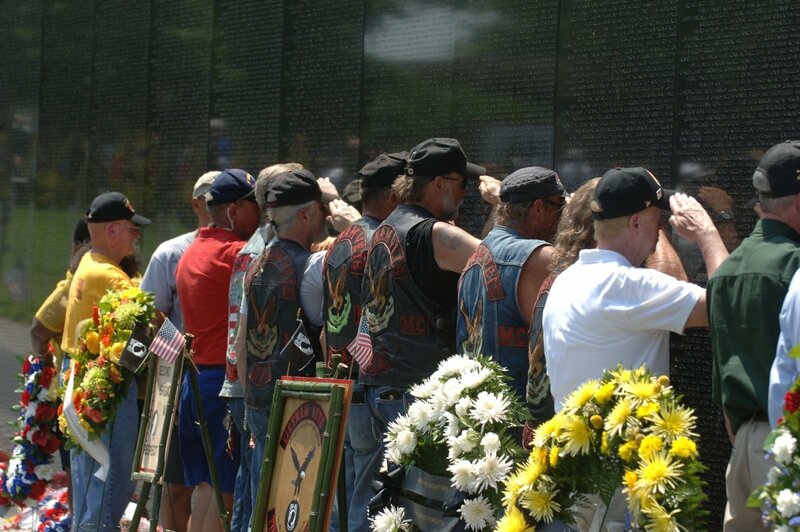 And Congress had declared a “Vietnam Veterans Week” for that April to honor those who had returned home. One film that came out early that year, The Deer Hunter, explored the effects of war on three friends, their families and a tight-knit community. When Scruggs went to see the movie in early 1979, it wasn’t the graphic war scenes that haunted him. It was the reminder that the men who died in Vietnam all had faces and names, as well as friends and families who loved them dearly. He could still picture the faces of his 12 buddies, but the passing years were making it harder and harder to remember their names. That bothered him. It seemed unconscionable that he–or anyone else–should be allowed to forget. For weeks, he obsessed about the idea of building a memorial. His research had proven that post-traumatic stress was real and had shone a light on the challenges faced by a significant number of military veterans. The idea for a memorial seemed like a natural extension of his work and his growing desire to find a way to help veterans. He had studied the work of psychiatrist Carl Jung, a student of Sigmund Freud, who wrote of shared societal values. As Scruggs analyzed the concept of collective psychological states, he realized that, just as veterans needed psychological healing, so too did the nation. Once Scruggs decided to build the memorial, the next step was to get some people behind him. An ad hoc group of veterans had scheduled a meeting to try to use Vietnam Veterans Week to generate publicity for veterans’ need, and Scruggs thought that would be a good time to announce his plans. But instead of enthusiasm, he received skepticism. Most at the meeting told him they didn’t want a memorial; they wanted more benefits and government support. But the meeting gave Scruggs his first ally: former Air Force intelligence officer and attorney Robert Doubek, who thought a memorial was a good idea. Doubek approached Scruggs after the meeting and suggested that he form a nonprofit corporation as a vehicle to build a memorial. On April 27, 1979, Doubek incorporated the fledgling entity, the Vietnam Veterans Memorial Fund, and Scruggs asked him to be an officer and director. To make his dream a reality, he planned to get support from people as diverse as former anti-war presidential candidate George McGovern and Gen. William Westmoreland, who commanded U.S. forces in Vietnam. Scruggs took two weeks off from his job at the Department of Labor to develop the idea further. One of Scruggs’s first moves was to hold a press conference on Memorial Day to announce their plans to raise $1 million to build the memorial. While media coverage was scant, it prompted a handful of supportive letters and a few small donations. Yet, by July 4th, VVMF had collected only $144.50, a fact that was reported on the “CBS Evening News” and lampooned on late-night television. This may have seemed a low point for the project, but it caught the notice of someone else who became a valuable ally. 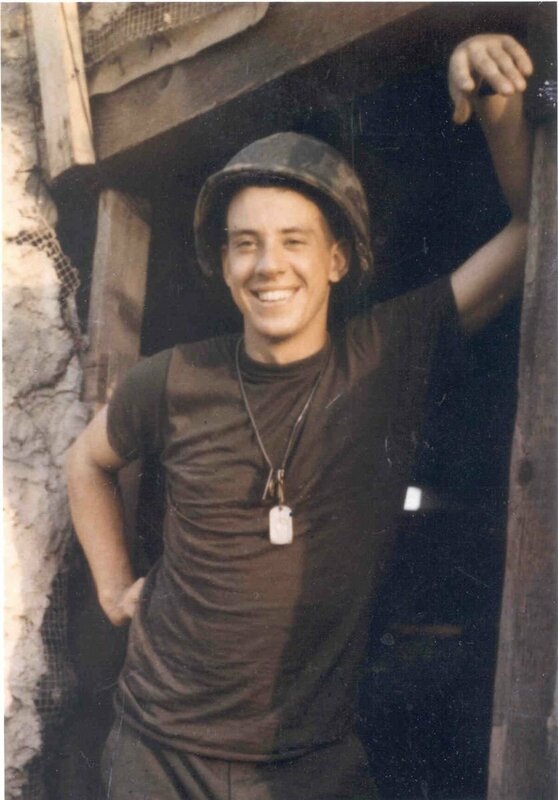 John P. “Jack” Wheeler III, a graduate of West Point, Yale Law School, and the Harvard Business School, had served in Vietnam. He had also spearheaded the effort to build a Southeast Asia Memorial at West Point. He understood the challenges that building a national memorial would pose. Wheeler reached out to Scruggs. Although they were very different personalities, it was clear from their first meeting that they shared a common vision to honor those who had served in Vietnam and a similar, single-minded “can do” attitude. Wheeler recruited others to help, starting with a group of professional men, all Vietnam or Vietnam-era veterans: George “Sandy” Mayo, Arthur Mosley, John Morrison, Paul Haaga, Bill Marr, John Woods and certified public accountant Bob Frank, who agreed to become VVMF’s treasurer. Paul Haaga’s spouse, Heather Sturt Haaga, soon came forward to lend her experience in fund raising. William Jayne, who had been wounded in Vietnam, volunteered to head up public relations activities. The greatest challenge VVMF faced, said Doubek, was “to put together a functioning organization with people who didn’t know one another, people who were very young and didn’t have a lot of experience. We had to constantly find the most effective next step to take and be sure not to get waylaid by tangents.” The group started to hold regular planning meetings. For Woods, the growing coalition was a prime example of “it’s not what you know, it’s who you know.” These people, though a small group, were able to reach out to their networks and their extensive contacts to recruit the type of expertise and support required for such a mammoth initiative. Their military experience meant they had contacts far and wide, at all levels of all professions, within government and the private sector. It seemed every time they contacted someone, they were greeted with enthusiasm for the idea. Everyone wanted to join the effort. And if they themselves didn’t know how to help, they knew someone who did. Their initial timeline was aggressive, with an ultimate goal of dedicating the Memorial on Veterans Day 1982—just a little more than 36 months away. The list of tasks to achieve such a goal seemed endless. They needed to secure a plot of land, raise funds and public awareness, design the Memorial, coordinate construction, and organize the dedication ceremonies. Most importantly, they needed to navigate the channels of government authorizations and approvals. Never in the history of the United States had a national memorial been conceived, approved, built and dedicated in that short an amount of time. But if the challenges seemed insurmountable, no one expressed any fears. And none of them discussed their own personal feelings or political views regarding the war. All of them realized how critical it was that a memorial be apolitical. They set their sights in support of the clear, simple vision Scruggs outlined: to honor the warrior and not the war. Senators John Warner (R-Va) and Charles "Mac" Mathias (R-Md). 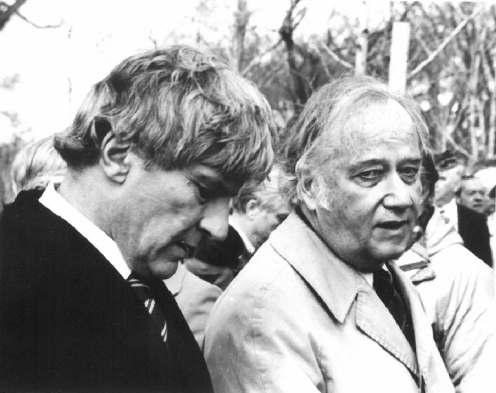 On November 8, 1979, these two senators introduced legislation to provide space on the National Mall as the site of the Vietnam Veterans Memorial. The VVMF organizers soon learned that it required an Act of Congress to build a memorial on Federal land, and Scruggs first called one of the senators for his home state of Maryland. Charles “Mac” Mathias, a Navy veteran of World War II, had been opposed to the war in Vietnam, but he had always respected those who served in it. Mathias had grown increasingly concerned about how veterans had been treated on their return. Because he possessed great knowledge of history, he understood the extensive healing process required after war. A memorial made perfect sense to him. It would be a way to honor the veterans and to help them—and the country—heal. Mathias also knew the country was ready, Healy recalled. Timing is everything, and enough time had passed. Intellectually and emotionally, America could embrace the idea. Scruggs and Doubek met with Mathias to outline their plans. They stressed that all funds for the Memorial would be raised from private donations. No government funds would be necessary. What they did need, however, was an acceptable location for the Memorial and enough support to push the idea through various governmental committees and agencies. One of Mathias’ early key suggestions was that the memorial should be on the Mall, especially because the anti-war demonstrations had taken place there. Wheeler had the idea to bypass the traditional site selection route and have Congress pass legislation to award a specific area for a memorial site. Scruggs, Wheeler, and Doubek then scouted the Mall – sometimes by bicycle - to identify the ideal spot: a stretch of parkland known as Constitution Gardens, located on the National Mall adjacent to the Lincoln Memorial. As they forged a partnership with Mathias and his staff, VVMF also set out to establish other key relationships. Scruggs took a bold step in contacting Virginia Senator John Warner. Warner, who had served as Secretary of the Navy during the war, was himself a veteran of World War II and the Korean War. After meeting with the VVMF officers and advisors, Warner volunteered to help the organization raise the seed money needed to launch the fund raising campaign. Because Warner was from Virginia and Mathias from Maryland, the two had worked together on many regional issues. “We had been friends for a long time,” Mathias said. “He was an excellent partner and fundraiser.” Mathias knew the legislative process. Warner, at the time married to Elizabeth Taylor, had strong connections to both Hollywood and the corporate world. 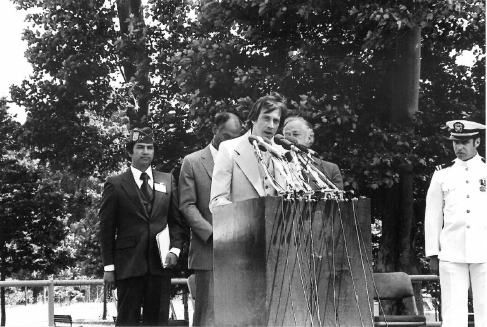 On November 8, 1979, VVMF held a press conference in which Mathias, Warner, and several others announced the introduction of legislation to grant two acres of land near the Lincoln Memorial for the Vietnam Veterans Memorial. 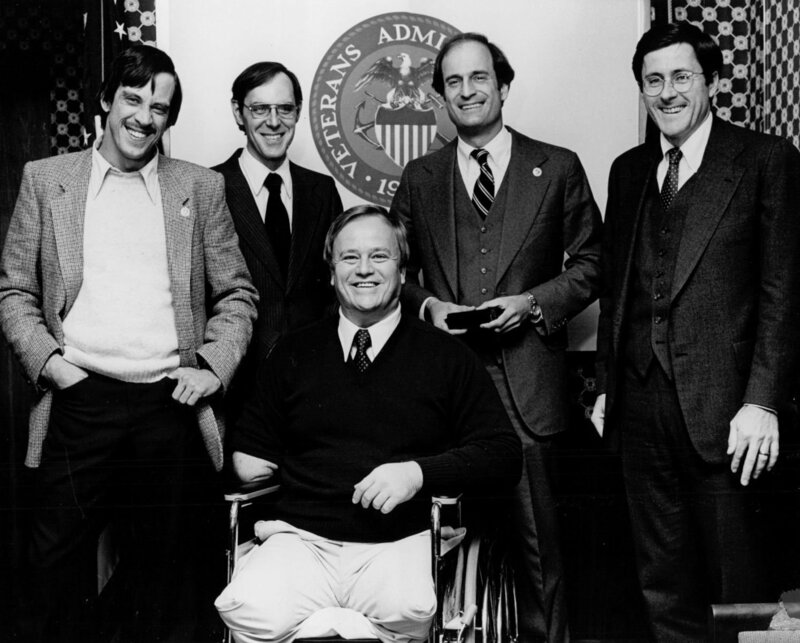 Jan Scruggs, William Jayne, Robert Doubek, and George Mayo (standing left to right) meeting with Administrator of Veterans Affairs Max Cleland, December 4, 1979 (Veterans Administration). With the introduction of legislation, the VVMF leaders realized that it was time to transition from a volunteer committee and to open a staffed office. In December Doubek became the Executive Director, working on a half-time basis for the first few months, and opened the VVMF office on January 2, 1980. He organized the advisors and volunteers into task groups: public relations, financial management, fund raising, legislation, site selection, and design/construction. The priorities were to launch fund raising and achieve passage of the authorizing legislation. The task groups proved effective, as described by John Woods, who jointed as a key advisor. He cited the growing coalition was a prime example of “it’s not what you know, it’s who you know.” These people, though a small group, were able to reach out to their networks and their extensive contacts to recruit the type of expertise and support required for such a mammoth initiative. Their military experience meant they had contacts far and wide, at all levels of all professions, within government and the private sector. It seemed every time they contacted someone, they were greeted with enthusiasm for the idea. Everyone wanted to join the effort. And if they themselves didn’t know how to help, they knew someone who did. After working alone for six months, Doubek was joined on the staff by Kathy Kielich, who served as the Office Manager throughout the project. 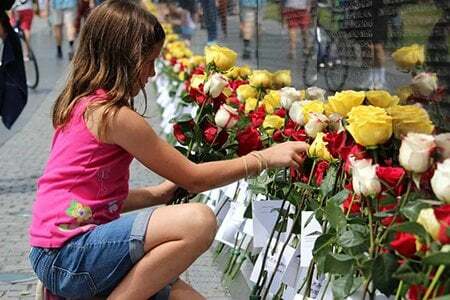 The Gold Star Mothers is a group of mothers whose sons or daughters have died serving their country. Their motto is: "Honor the dead by serving the living." Volunteering to assist VVMF was an ideal opportunity for Cupp to do just that. Scruggs and Doubek realized that Cupp could be instrumental in helping communicate the all-important personal, emotional side of the healing story. Cupp attended many of their meetings on Capitol Hill as they drummed up support. Just before Christmas 1979, Warner hosted a fundraising breakfast in his Georgetown home. He made an impassioned plea for funding to his guests, members of the defense industry. Before he spoke, however, all eyes had turned toward the kitchen door, from which has emerged his then-wife, actress Elizabeth Taylor. She greeted each visitor in a regal fashion, wearing a dressing gown, perfect makeup, and beautiful shoes that curled up at the toes. “I’m sure I looked like a deer in the headlights, I was so nervous,” Scruggs recalled. “I think I even spilled my coffee.” But, her presence made a difference. “I heard that those present agreed to double their contributions after Taylor completed her remarks,” Scruggs said. With the seed money from several defense industry donors, especially Grumman Aerospace, VVMF launched its first large-scale direct mail campaign to reach out to the public. To created credibility for the fledgling effort, they formed the National Sponsoring Committee, which included then-first lady Rosalynn Carter, former President Gerald Ford, Bob Hope, future first lady Nancy Reagan, Gen. William C. Westmoreland, USA, Vietnam veteran author James Webb, and Adm. James J. Stockdale, USN. The first fundraising letter was signed by Bob Hope. It echoed the theme that regardless of how anyone felt about the war itself, everyone cared about honoring the men and women who had served and those who had ultimately lost their lives. By early 1980, contributions started to arrive. Millionaire H. Ross Perot made a sizeable donation. Direct mail was proving to be a highly effective fundraising tool. Letters came from moms, dads, grandparents, sons and daughters with heartfelt notes accompanied by checks and dollar bills. They came from veterans and from the neighbors, teachers, coaches and friends of veterans. The public wanted to have a hand in helping to build the Memorial and in honoring the warrior, not the war. After the bill authorizing a memorial to Vietnam veterans passed in the Senate, those who worked for its passage gathered for a photo. Jan Scruggs is pictured in the center giving the "thumbs up." Others are, from left: Murray McCann; Lt. Cmdr. Jerry Bever, USN; Bill Marr; unidentified man; Ron Gibbs; Sen. Charles "Mac" Mathias (R-Md. 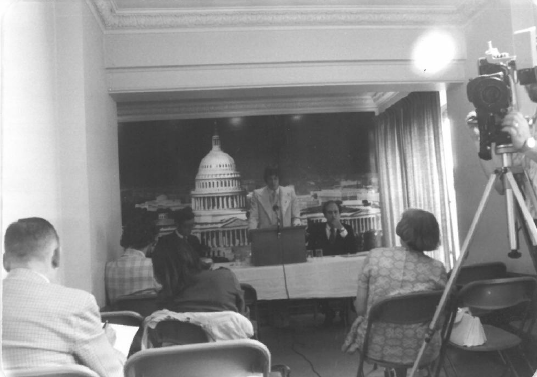 ); Sen. Robert Dole (R-Kan.); Jan Scruggs: Tom Cahart: Sen. Dale Bumpers (D-Ark. )l Bob Doubek; Arthur Mosley; unidentified man; Jack Wheeler; Bill Jayne; and Bruce Spiher. As VVMF focused on fundraising, Sens. Mathias and Warner continued to rally support and ferry the legislation. Mathias and Warner continually stressed that their objective was to provide the country with a symbol for reconciliation. On April 30, 1980, the Senate approved legislation authorizing the Memorial, followed by approval in the House on May 20, 1980. Although differences in the two bills required a Conference Committee to meet, on July 1, at a White House Rose Garden ceremony, President Jimmy Carter signed legislation providing two acres for the Vietnam Veterans Memorial on the National Mall. 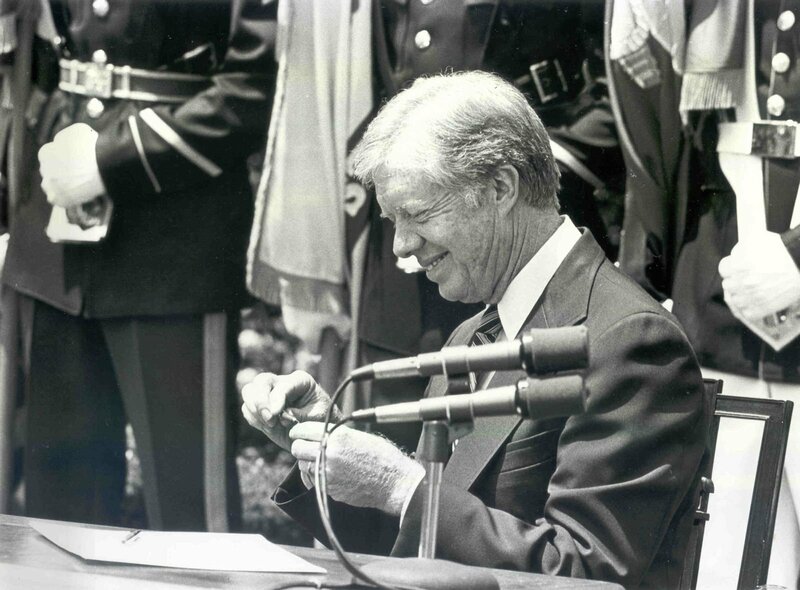 President Carter signs legislation providing two acres of land for the Vietnam Veterans Memorial on the National Mall, July 1, 1980. With the site approved, VVMF scrambled to address the issues of what the Memorial would look like and who would design it. A few preliminary concepts were embraced. As Scruggs had always envisioned, the Memorial would feature all of the names of those who had died. Wheeler suggested that it should be a landscaped solution: a peaceful, park-like setting that could exist harmoniously with the Washington Monument and the Lincoln Memorial. They were also keenly aware that the legislation made the Memorial’s design subject to the approval of the Commission of Fine Arts (CFA), the National Capital Planning Commission (NCPC), and the Secretary of the Interior. It was decided that VVMF would hold a design competition, open to any American citizen over 18 years of age. Just as the American people could be a part of building the Memorial through their contributions and support, they could also have an opportunity to participate in its design. As a first step, VVMF retained architect Paul Spreiregen to serve as the Professional Advisor for the competition. Spreiregen, a graduate of the MIT School of Architecture and Planning, was a Fulbright Scholar who had served as the director of urban design programs at the American Institute of Architects (AIA) from 1962-66 and as the first director of architecture programs at the National Endowment for the Arts from 1966-70. An author, teacher, and lecturer, Spreiregen had written the authoritative book on design competitions. At the time, well-managed open design competitions were common in Europe, but not in the United States. Most, like the Lincoln Memorial, were competitions between select designers. Only a few, such as the St. Louis Gateway Arch, part of the Jefferson National Expansion Memorial, had been the result of open competitions. There were four phases to the design competition spanning almost one year: planning and preparation; the launch; the design phase; the design evaluation and selection; the press conference and public presentation. The selected design then had to go through Federal agency approval and development into finished plans. 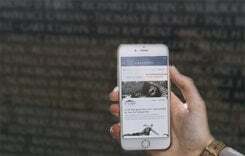 The purpose of the Vietnam Veterans Memorial was to honor all who had served, with a special tribute – their names engraved – for those who did not return. The chief design criteria were that the memorial be 1) reflective and contemplative in character; 2) be harmonious with its site and environment, 3) make no political statement about the war itself, and 4) contain the names of all who died or remain missing. "The hope is that the creation of the Memorial will begin a healing process," Doubek wrote. Healing meant many things to many people. Could a memorial accomplish such an enormous and daunting task? Could it heal the chasm within society, promote closure, show gratitude to those who served, comfort those in grief, and remind future generations of the toll wrought by war? Moreover, could it accomplish all of that while listing the approximately 58,000 names in an artistic, meaningful way? Selecting a design that would meet the criteria demanded a jury that could grasp the significance of the Memorial’s purpose and understand the unique needs of Vietnam veterans, their families, and a country divided. For weeks, heated discussions took place around the topic of who should be part of the design jury. Many felt it should be composed primarily of veterans; others felt it should be made up only of professionals; some thought a mix of the two would be best. Spreiregen recommended having a multi-disciplinary panel: two architects, two landscape architects, two sculptors, and one generalist with extensive knowledge about art, architecture, and design. VVMF met the prospective jurors and scrutinized their credentials. “They found that they were very real people who did many of the same things they did,” recalled Spreiregen. “They were real guys. The VVMF group liked them all and approved of them with trust and enthusiasm,” even selecting three sculptors, making a total of eight jurors. The jury included: architects Pietro Belluschi and Harry Weese; landscape architects Hideo Sasaki and Garrett Eckbo; sculptors Costantino Nivola, Richard Hunt, and James Rosati; and Grady Clay, a journalist and editor of Landscape Architecture magazine. Four of the eight were themselves veterans of previous wars. Each juror was required to read Fields of Fire, A Rumor of War, and other current literature about the Vietnam War. “Many had worked together, some in Washington. They were also the most collegial people, who would deliberate intensely but never argue or posture,” Spreiregen remembered. With the jury selected, the next task was to announce and promote the competition. In the fall of 1980, VVMF announced the national design competition open to any U.S. citizen, who was over 18 years old. By year’s end, 2,573 individuals and teams had registered – almost 3,800 people in total. From the registration forms, it was apparent that architects, artists, designers, as well as veterans and students — of all ages and all levels of experience — were planning to participate. They came from all parts of the country and represented every state. By the March 31, 1981, deadline, 1,421 design entries were submitted for judging. With such an overwhelming response to the competition, logistics became an issue. End-to-end, the total number of submissions would have stretched one and one third linear miles. Each submittal had to be hung at eye level for review by the jury. But how and where could all of the submissions be displayed? Vietnam veteran Joseph Zengerle, then an Assistant Secretary of the Air Force, volunteered the use of an aircraft hangar at Andrews Air Force Base. The added component of military security made the location even more attractive, since it would ensure no interference with the designs or the judging. In accordance with the strict competition guidelines, anonymity of all designs was carefully observed. Each contestant sealed his or her name in an envelope and taped it to the back of the submission. The designs were received and processed in a large warehouse east of Washington. They were unwrapped, number coded, photographed for the record, and prepared for display. 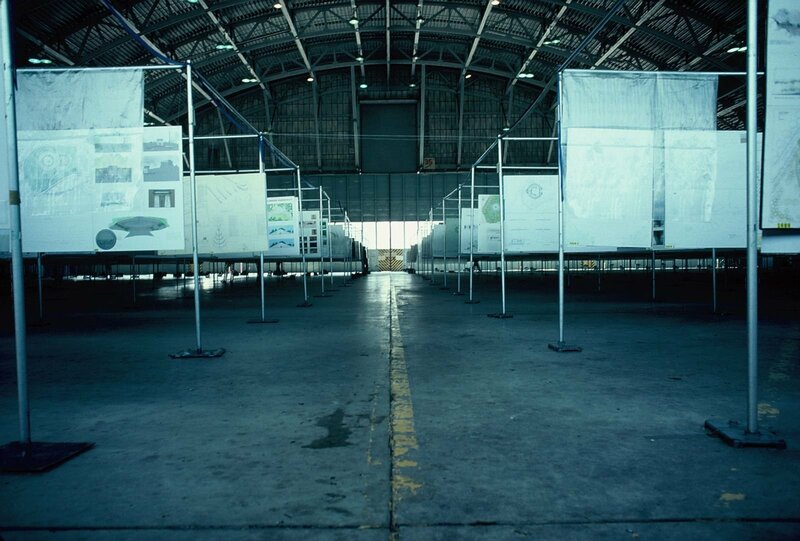 Display of 1,421 design entries in Vietnam Veterans Memorial Design Competition at Hangar #3, Andrews Air Force Base, Maryland, April 1981 (Robert Doubek). The jury evaluation took place over five days, from April 27 through May 1, 1981. The jurors began by touring the site and then returned to Hangar #3 at Andrews to view each of the 1,421 designs individually. “On the second day, the jury examined the designs together, walking the many aisles and stopping at each of the 232 designs that had been flagged by one or more of the jurors, pausing to discuss each design that had been noted. The first cut was further reduced to 90 by midday Wednesday. By Thursday morning, it was down to 39. That afternoon, the winning design was selected,” said Spreiregen. “It was the most thoughtful and thorough discussion of design that I have ever heard, and I have heard many,” he recalled. With the winning design in hand, Spreiregen had less than 24 hours to craft an explanation of the decision—and the design—that would be suitable for presentation to VVMF. Throughout the judging process, one of the judges, Grady Clay, had taken meticulous notes of the jury’s discussions. Together with Spreiregen, he composed a report based on these thoughtful comments. “They are a treasure of design insight and included many prescient thoughts as to how the Memorial would likely be experienced,” Spreiregen wrote of Clay’s notes. Learn more about Maya Lin's winning design. Learn more about The Wall. Excerpts taken from the VVMF Book, Never Forget: The Story Behind the Vietnam Veterans Memorial, published in 2008. Updated in 2016 by VVMF.